Now enrolled on LLB Law and in her second year, Alexandra has found that Law courses at LSBU have a number of distinct features to support teaching and learning. Students are encouraged to volunteer at the Legal Advice Clinic, which offers free legal advice to members of the general public. Students are supervised but are able to interview and advise clients, giving them valuable professional experience. "Volunteering at the Legal Advice Clinic was truly educational," Alexandra said. "I've learnt a lot about the application of the law to real life situations and about client care within the legal environment." London South Bank University (LSBU) has an active student law society, and Alexandra was elected as secretary last year. "We organise guest speaker events, charity fundraising and networking events," she explained. "I've been contributing articles to the student magazine too, and I do enjoy reading it as well, as it has relevant articles to our studies." Guest lecturers are normally high profile speakers and are approachable, down to earth, kind and interested. Their lectures are complementing our studies as well as directing our attention to new areas of law. Alexandra has found that the focus on employability and career skills of the law course has already had an effect. "I was made redundant from my part-time job, so I had to find another job. I had a couple of interviews and got offered the job both times – I think that's down to my improving employability. The 'Working in the Law' module helped us develop our CVs and portfolio of work, and made me evaluate my professional skills and future prospects." A highlight of Alexandra's course has been participating in a mooting competition where she reached the final, which was held at the Supreme Court and judged by Supreme Court Justice, Lord Kerr. A moot is a legal debate acted out in a courtroom usually involving a hypothetical case. Taking part helps students develop their skills in a pressurised yet safe environment. "I lost the final, but in fact I won an incredible experience I will never forget," said Alexandra. 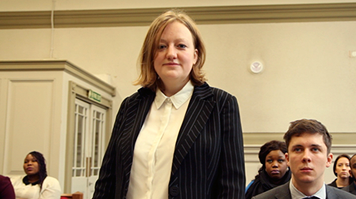 Watch our video, featuring Alexandra, about what it's like to study Law at LSBU.